Our list of new books is now updated. 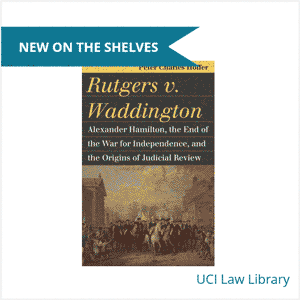 Last month, the Law Library received books on immigration, intellectual property, and international law, among other topics. Through this little-known but remarkable dispute over back rent for a burned-down brewery, Peter Charles Hoffer recounts a tale of political and constitutional intrigue involving some of the most important actors in America’s transition from a confederation of states under the Articles of Confederation to a national republic under the U.S. Constitution. Check it out upstairs in the Reading Room at KF 228.R877 H64 2016. Hamilton fans: this case took place during the time covered by Act 1’s finale, Non-Stop, when Hamilton practiced law in New York. It’s not specifically called out in the song’s lyrics, but Waddington got quite a bit of coverage in Chapter 10 of the 2004 Chernow biography.